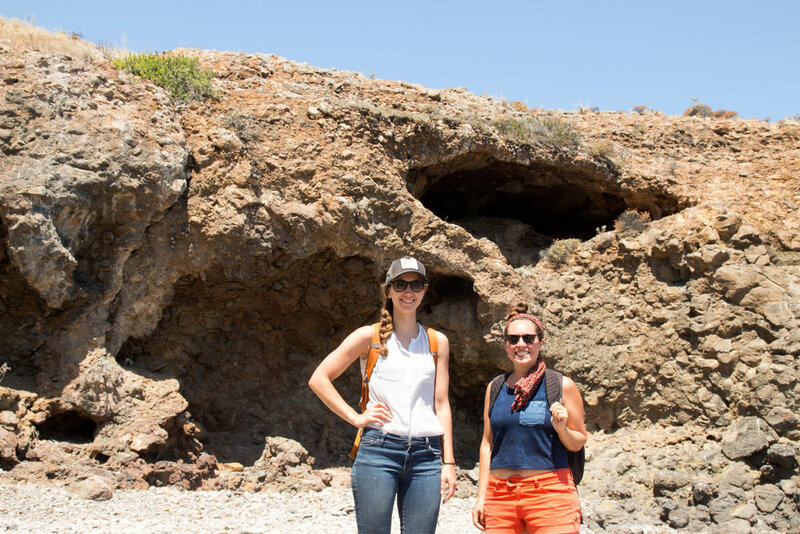 Participants were lead on a dérive through the natural habitat on Santa Cruz Island, using walking protocols to experiment with modes of getting lost and structures of interaction or mappings, as catalysts for change and meaningful engagement with local environments. 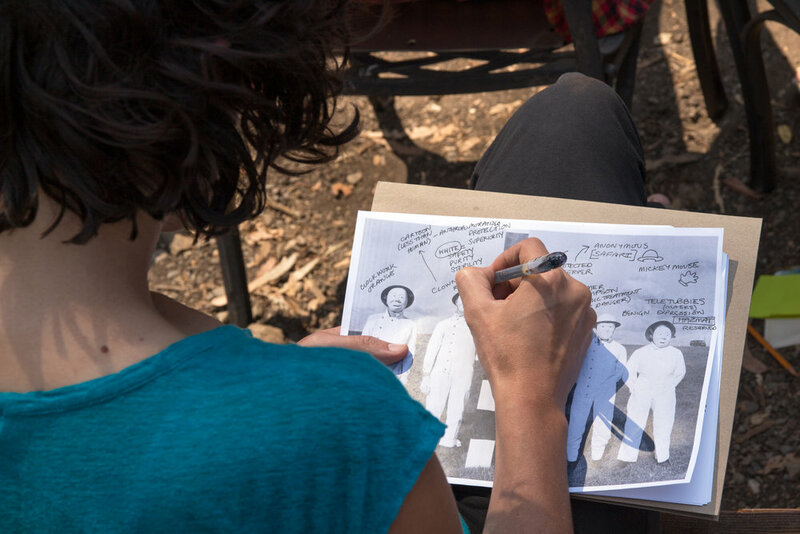 This session engages the group in an analysis of a photograph that eerily evokes the 1918 photograph that inspired the Mapping Meaning gathering. This image was taken a generation later, in 1956, in the midst of the 20th-century pursuit of modernity, and depicts a field trial at Porton Down, Great Britain’s science and military park. Masked figures stand together in a field, before or after a weapons test, posing for a camera to document the work they were doing. How might working at a table with others lead to casual conversation, silent workflow together, hybrid outcomes? How might working alongside others change the subject, create new edges and shapes for emergent knowledge? What can sketches do that text can’t? "... As we contemplate our continued collective trajectory and engagement with our environment and one another, Xica seeks to question the influence and authority of the historic record, while playfully jostling and repurposing its visual remains." The Breath Camera is part of a toolkit to expand on the practice of noticing multiple subjectivities while immersed in a camera-form. It is a camera bellows with fabric on the front, viewing screen material on the back and a 3 foot x 9 foot darkcloth to envelop the person using the device. This storytelling walk meanders along the island’s eastern shoreline, stopping along the way to look back at the mainland and the long tail of the twentieth century. Through monologues, discussions, storytelling, readings, and photographs, we will (re)construct my grandfather’s life for an Anthropocene, casting our lot with the infrastructure he fathered as surely as his own children, as well as the ecologies and organisms he disavowed. 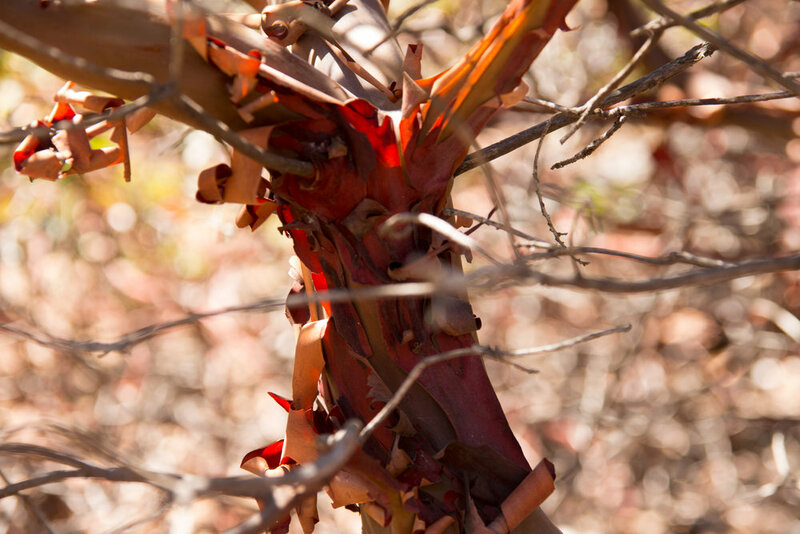 The 2016 workshop was held on Santa Cruz Island, a part of Channel Islands National Park in California. 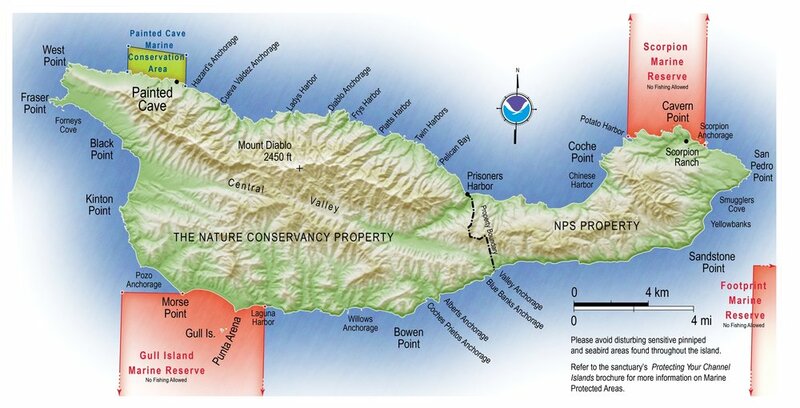 Close to the densely populated region of Southern California and yet one of the least visited of all national parks in the United States, the Channel Islands bridge two biogeographical provinces and are home to 145 endemic species. 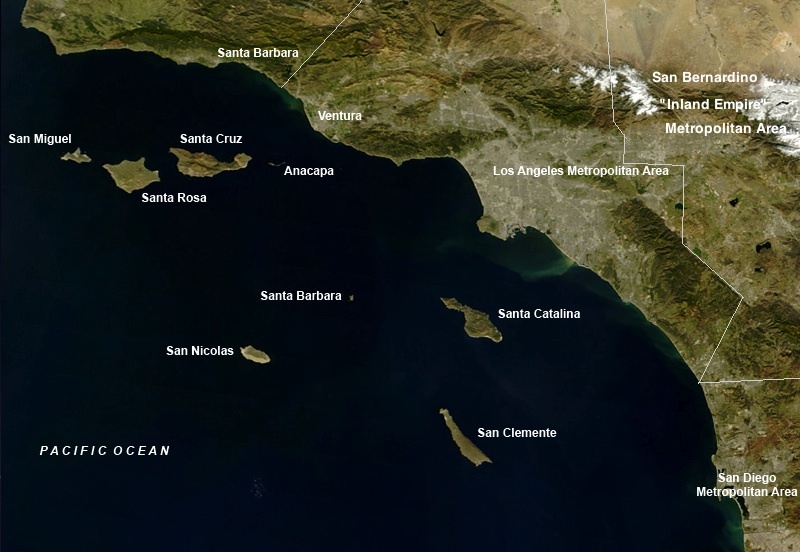 Santa Cruz Island is the largest and most diverse of the eight islands and has been an important site for thousands of years for people, including the Chumash who call the island Limuw ("in the sea"). By shifting our location away from the Colorado Plateau (2010, 2012, 2014) the 2016 workshop considered how island ecologies and processes that operate at small scales might stimulate/provoke new questions and modes of thinking about larger patterns. How might we as scientists, artists and scholars envision ourselves as a “traveler species” able to promote a kind of primary productivity that cascades through disciplines and encounters? In the Three Ecologies Félix Guattari states, “there is at least a risk that there will be no more human history unless humanity undertakes a radical reconsideration of itself.” How might we promote a radical reconsideration of the role humanity plays in a more-than-human world? Looking to unmake fictitious histories that place the human at the center and where certain cultures dominate, Mapping Meaning looks to create alternative narratives and encounters.